Caps Basketball: Blame Game: Did Braden Holtby Give Up Six Goals? Blame Game: Did Braden Holtby Give Up Six Goals? Hockey is finally back. 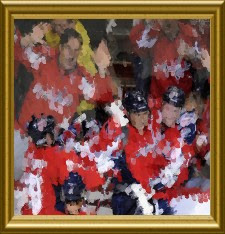 For the Washington Capitals, however, it came back not with a bang, but a whimper. Saturday night, at the Tampa Bay Times Forum the Capitals came out strong but then faded quickly in their 6 – 3 "most beautiful loss in the world". Whenever a team scores six goals against you people are going to look for a scapegoat, and when the finger pointing starts it’s usually focused at the goaltender. But should it? Braden Holtby is already a household name in Washington DC thanks to his heroics last spring during the Stanley Cup Playoffs. The thing fans forget, though, is that the 23 year old netminder is still a rookie. This is his first regular season on an NHL roster. All rookies are going to take some time to find their footing and Braden is no exception. The new style of the Washington Capitals is a much more open, flowing style than it was during the Dale Hunter era. This leads to the dreaded “odd-man rush”. When faced with these 2 on 1 or 3 on2 situations it is imperative that the defense block the passing lanes and leave the initial shot to the goalie to stop. This did not happen several times and the Lighting capitalized with quick passing one-timers that several times found the back of the net. Goal 1 – Shultz, Perreault and Poti form a wall in front of Holtby. Add in a lightning player and there is no way that Braden could see anything. The forwards should have been much higher in the slot and pressuring the D-men at the point. 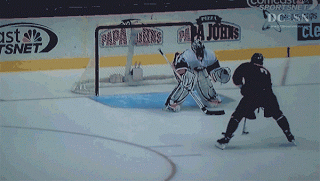 Goal 2 – Holtby catches the edge of the first shot, forcing it to go off the post. Then after tripping Hendricks, Braden gets back to make the second save. Finally when trying to make a third save Holtby is interfered with as his own defenseman, new acquisition Hillen, slides through his crease. A goalie should only have to make the first one or two saves. After that the Defense should have either cleared the puck, or the opposite team playing it. Fault: Hillen & the collapsed forwards. Goal 3 – On this play Holtby makes three saves before the puck finally sneaks in. First he bails out a bad play by Carlson, then another by Green. The third shot was just good work by the lightning. The final shot came as both Carlson and Green tried to double team a forward behind the net (where he couldn’t score from anyway) leaving forward Troy Brower to try to handle the attackers. The shot comes from right in front and maybe could have been handled by Holtby, but he shouldn’t have had to. Goal 4 – Now this is a power-play goal by the Lightning so it’s hard to fault anyone other than the guy in the box. This goal is scored on a hard point shot through traffic. Only one screener in front of Holtby, so even though it’s not his fault, I am going to blame him. Goal 5 – This goal is exactly what I mentioned before about the odd-man rush. The Caps get beat early giving up a 3 on 1 rush. Mike Green, who has not been playing during the lockout and may not be in game shape just yet, goes after the player with the puck leaving to trailers wide open. One quick pass and a tap-in later and Tampa is celebrating their insurance marker. Goal 6 – This was another power play goal for the Lightning. Add to that the fact that Poti, Carlson, and Backstrom were all practically in the crease with Holtby and you have a recipe for disaster. – Fault: Defense and the guy in the box. If it wasn’t obvious before, it should be now, that it takes much more than a goalie to keep pucks out of the net. Holtby still has some things to work on, but this loss should not be thought of as his fault. Not in the slightest. I am sure that he will get the start again Tuesday night when Winnipeg comes to the Verizon Center and as long as his teammates can stay out of their own way, he should be able to easy redeem this performance.